Frozen Class A chicken wings. Rustle up the perfect party snack or tasty treat for a big night in: smother the wings with a tangy BBQ sauce then bake until sticky and delicious. Instructions: From Defrost 200°C/Fan 180°C /Gas 6 25-30 mins Follow defrost instructions below. Place defrosted chicken wings on a baking tray in the centre of pre-heated oven for 25-30 minutes. 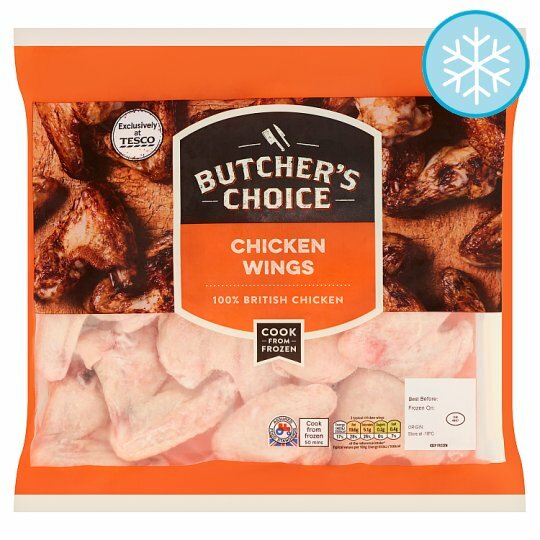 Instructions: For best results cook from frozen 200°C/Fan 180°C /Gas 6 45-50 mins Place frozen chicken wings on a baking tray in the centre of pre-heated oven for 45-50 minutes. Check food is cooked thoroughly and juices run clear when pierced with a thin skewer before serving. Keep frozen at -18ºC or cooler. Defrost thoroughly for a minimum of 8-12 hours in the refrigerator. Caution: This product contains raw meat.Caution: This product will contain bones.Warning: Plastic bags can be dangerous.To avoid danger of suffocation, keep this bag away from babies and small children.